Last week, China turned down a request for a U.S. Navy helicopter carrier to visit Hong Kong. And in May, the Chinese Navy was disinvited to this year’s RIMPAC exercises that attracted 25 countries from across the Asia-Pacific region. Both developments are pretty big deals in U.S.-China relations. Here’s why. For decades, Hong Kong was a key port of call for U.S. Navy ships operating in the Pacific. The Navy would send warships to Hong Kong for rest and relaxation after lengthy sea patrols, allowing sailors the luxury of visiting one of the most exciting cities in Asia. Hong Kong was known for its nightlife and cheap goods, especially bespoke, finely tailored suits—just the thing a 19-year-old sailor on their first trip outside the country on a big sweaty boat needed. The city’s status as a crown colony of the United Kingdom guaranteed American access, even during the Vietnam War. USS Constellation visiting Hong Kong. Hong Kong reverted to Chinese control in 1997, and the Chinese government, which had frequently protested visits of American warships to what they viewed as a Chinese city, gained veto rights over the visits. But despite the handover of power, visits by American warships continued as they always did. A U.S. aircraft carrier or amphibious assault ship typically visits Hong Kong every other year, with the latest visitor being the nuclear-powered aircraft carrier USS Ronald Reagan in October 2017. That’s started to change, however. 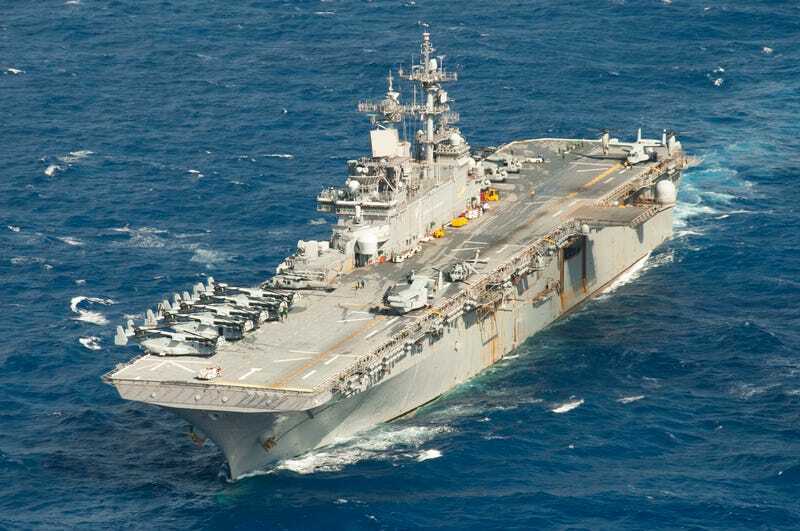 A Reuters report states the Chinese government rejected a request by the U.S. Navy for the amphibious assault ship USS Wasp to visit Hong Kong. The incident follows a April 2016 rejection of a visit request for the aircraft carrier USS John C. Stennis. In 2007, China cancelled a visit by the carrier USS Kitty Hawk at the last minute, to the disappointment of Navy families in Hong Kong who had flown in to spent time with crew members on liberty. These cancellations were widely seen as retaliation for American policies and actions China disagrees with, such as America’s stance on Taiwan and the South China Sea. In this latest case there are plenty of reasons why China might have rejected the request. The U.S.-China trade war, B-52 bomber flights in the vicinity of the South China Sea, American criticism of Beijing’s treatment of its Muslim Uighur minority, and the Chinese purchase of Russian Su-35 fighter jets in violation of U.S. law are just a handful of issues the two countries are at odds over. The United States just approved a $330 million sale of military maintenance parts and supplies to Taiwan, which China officially considers a rebel province. Chinese destroyer Qingdao visits Pearl Harbor, 2013. Meanwhile, the Chinese Navy has voyaged to the United States just a handful of times. Chinese warships visited Pearl Harbor in 2006, and a second time in 2013. The Chinese Navy was invited to participate in the multinational Rim of the Pacific (RIMPAC) exercises in 2014 and 2016. The Chinese Navy then visited San Diego in 2016, sending two frigates and an oiler to the largest naval base on the West Coast. The People’s Liberation Army Navy, as China’s navy is officially known, hasn’t visited the U.S. since 2016. China was invited to return for the 2018 RIMPAC exercises, but the invitation was rescinded this spring due to Beijing’s militarization of the South China Sea—something the U.S. said was against the “principles and purpose” of the exercise. Why have these visits to begin with? Both sides see value in the port visits for their own reasons. The U.S. Navy sees visits to Hong Kong not only as a place for its sailors to get some R&R and as a means of friendly engagement, but as a way to project American power and presence. The Navy further sees Chinese Navy visits to America as a means to build ties. China, on the other hand, seems to view warship visits to the U.S. with a more practical bent, an ambitious understudy that hopes to someday match or exceed leading naval power in Asia. Despite their value, such visits are increasingly unlikely. The relationship between the U.S and China increase seem to worsen on a weekly basis, far beyond traditional differences over Taiwan, human rights, and trade issues. Chinese Type 052C destroyer X’ian at RIMPAC 2016. As a result, it seems likely that port visits will be on ice for a while. Neither country is interested is going to ask the other for a port visit and risk an embarrassing denial. This has happened before, but relations always improved and the visits continued. This time however America’s attitude towards China is hardening and China—particularly leader Xi Jinping—is in no mood to show weakness by acquiescing. Washington hasn’t seen this kind of rapid erosion of ties with a near-peer power since Stalinist Russia and the onset of the Cold War. Port visits are a good thing, particularly for countries that aren’t allies. Supporters say that they’re a sign of good relations and cooperation between two counties. A friendly warship visit says the two countries involved are not going to war anytime soon and are interested in good relations. What does it mean when two countries cancel these visits? We might be on the verge of finding out.